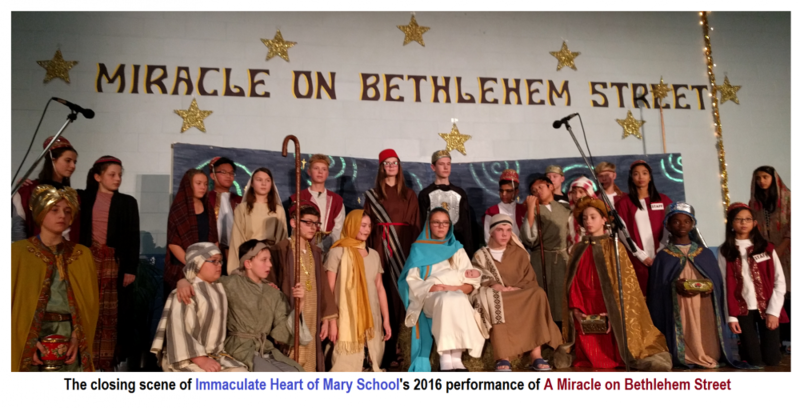 Parents, Grandparents, Clergy, Sisters and many visitors were inspired by the enthusiastic, joyful and professional Christmas season productions of “HUMBUG” and “MIRACLE ON BETHLEHEM STREET” at Winnipeg’s Immaculate Heart of Mary School. 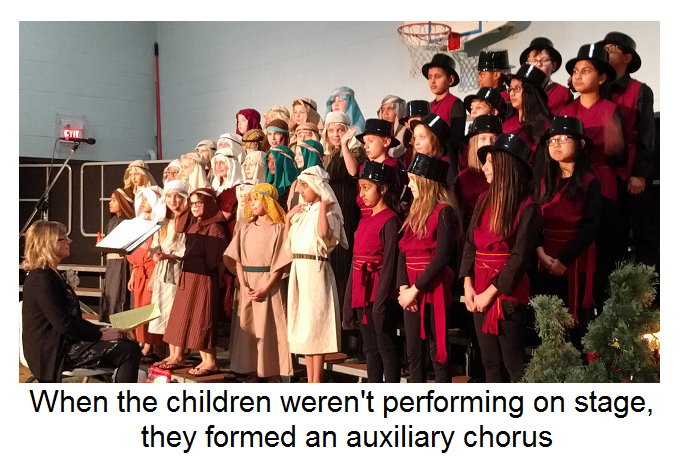 The younger grades, K-3, performed Humbug for two shows - matinee and evening - on Tuesday, December 20th. The older grades, 4-8, performed ‘Miracle on Bethlehem Street’ the following day, Wednesday 21 December also for two performances – at 1:30 pm and 7:00 pm. School Principal, Rod Picklyk, welcomed the guests and introduced the production. It was at that time on the second day that an unexpected heart-warming moment occurred that set the spirit for the performance ahead. Sr. Anne Pidskalny, SSMI, had brought in the K-3 children to sit at the back as part of the audience as they had already done their performance of Humbug the previous day. When Mr. Picklyk greeted the audience with the typical greeting of Glory to Jesus Christ in Ukrainian (Slava Isusu Khrystu!) the children shook the room with a bold and joyful response: Slava naviky! (Glory forever!). Principal Picklyk also told the audience about the Pilipivka projects that the students and staff of the school are involved with in preparation for Christmas. One project is a fundraiser to help the people of Ecuador and another supporting the local Marian Hour radio program on 810 CKJS. It was apparent that a lot of work was put into the production and it was obvious that many people helped – including the parents – to make it the excellent performance that it was. The costumes, the props, the songs and even the stage choreography all seemed impeccable. Special recognition was given to the School’s Music teacher – Mrs. Oksana Stanowych – who has consistently led the children through excellent shows over the last number of years. Everyone left the auditorium with heart and soul raised up to meet the season… Thanks to the children of Immaculate Heart School and their teachers and parents… Christmas was truly on! God bless them all with a wonder celebration of the Nativity of Christ!